Toppy Minder: Recordings is a free for personal use Android app for Topfield Smart PVR TF-T6211. 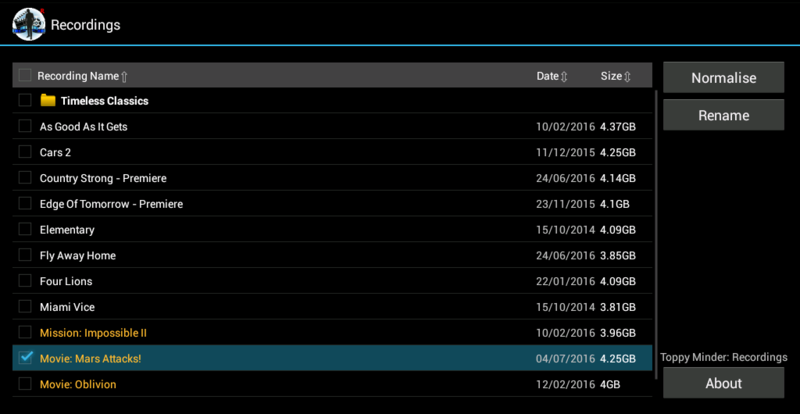 The app manages the names of the user recordings so that they can be stored on an external disk or copied over the local network via Samba. Toppy Minder: Recordings allows you to rename the recordings (either individually or in bulk) to comply with the Windows file naming conventions. The compliant files can later be copied to an external hard drive (wich is usually formatted with the NTFS of FAT32 Windows file system), or via Samba (the file names won't be mangled). View the recordings in a dense list. The recordings with unsafe names are highlighted. The sub-folders are marked with a folder icon. The sub-folders can be entered by long-clicking on the line. To return - press Exit. Each folder is processed independently (no recursion). Sort the list (ascending and descending) by name, size and date. Select / deselect all or individual recordings. Rename the selected recording. The new name is validated for unsafe characters. 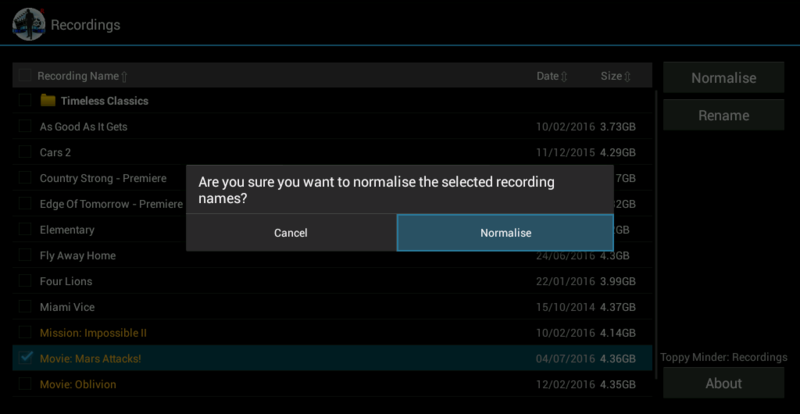 Normalise the names of selected recordings. The unsafe characters are automatically replaced. The "Movie:" prefix is stripped. Free for personal use. We removed the ads that were present in version 1.0 and now solely rely on your donations. Download the app to your 6211 and open it. The easiest way to do it is by using 6211's web browser - just navigate in it to the Downloads page and download the app. Then open Downloads in the Apps screen and click on the downloaded app. The system will ask if you want to install the app. 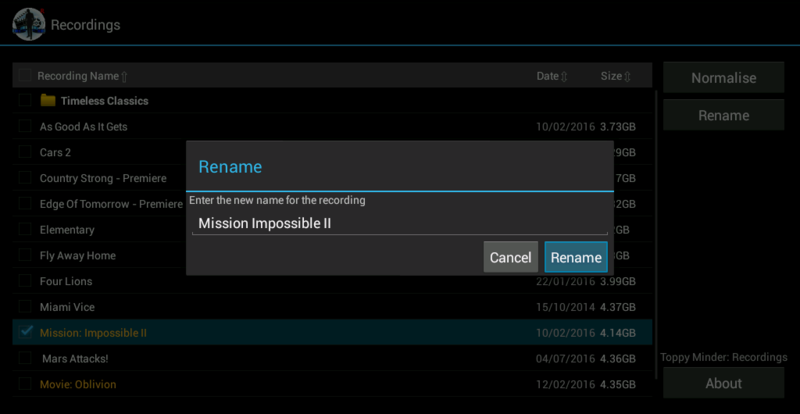 The app requests permissions to read/write the storage - to rename the recordings. Accept it. That's all. The app was designed with a standard Toppy remote control in mind. All the features can be accessed with the standard arrow buttons and the Ok, Exit and App (white) buttons. The App button works on the 6211 as the Android Home button - it switches to the home screen, which is Live TV in 6211's case. The app remains active (passive, really) in the background. If you launch it again, it is resumed. The ads were removed in version 2.0. Please consider making a small donation.